Bradley offers solid plastic Lenox™ Lockers made from highly durable 100 percent post-consumer recycled high density polyethylene (HDPE). On average, each Lenox Locker prevents more than 500 milk jugs from going into landfills. The completely recycled plastic lockers are just as durable as those with less recycled content. Available in a choice of four colors—moss, toffee, beige and charcoal gray—Lenox Lockers are unaffected by moisture and will not rust. The perfect solution for college campuses, parks or anywhere else where filtered water could quench a thirst, Willoughby's Willoughby CWBF-100 quick-fill outdoor bottle filler provides convenience and helps to reduce the waste from plastic water bottles. Crafted from fully welded Type 304 stainless steel, the fixture is extremely durable and vandal-resistant. NextLock by Digilock is the clear choice for employee storage, featuring intelligent, electronic locks that are simple to use and easy to manage. Unique to NextLock is the Manager Flex Key. 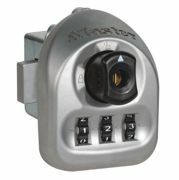 With this key, store managers can easily program locks and gain immediate access to any locker. For users, lockers operate with a four-digit code. A proven solution, NextLock is the preferred choice among retailers with more than a half-million installations worldwide. For more than 35 years, family-owned Texon Athletic Towel has supplied quality and cost-effective towels in various sizes and styles to schools, government, municipalities and athletic franchises nationally, including gym towels, microfiber, colored, white and center striped towels. 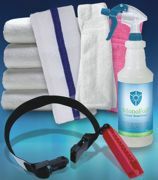 Texon Athletic Towel also provides laundry supplies, such as anti-microbial solutions, laundry carts, laundry trucks, laundry bags, laundry collars and more. 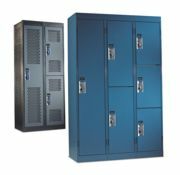 Hadrian Inc. offers a full range of exceptional locker products, including Emperor (corridor) lockers, Gladiator (athletic) lockers, and easy-to-install Replacement Front lockers, which install directly over the frames of existing lockers. Hadrian's double-pan door design with honeycomb core resists impact and ensures consistently quiet operation. Available in a wide selection of durable powder-coated colors (including anti-graffiti and special effects finishes), Hadrian lockers provide an attractive and effective storage solution. The new, easy-to-operate Multi-User lock from master Lock is designed for facilities with multiple customers using the same locker throughout the day. It reduces specific, time-consuming procedures by allowing the client to set their own personalized three-digit combination that clears for the next user. A supervisory override key allows access to any locker at any time for instances like a forgotten combination. Finlandia Sauna is celebrating 50 years of manufacturing authentic saunas. You can count on Finlandia's custom craftsmanship and unmatched quality. Offering a wide range of affordable precut sauna packages, custom sauna packages and modular sauna rooms that can be included in any fitness center remodel or new construction. Finlandia has a selection of four all-clear western softwoods available, still uses true 1-by-4-inch paneling in every sauna. Offering superior electric sauna heaters imported from Finland, and a nice assortment of etched glass designs and authentic sauna accessories.